Sanaa (AFP) - A Yemeni man was shot dead Sunday when police tried to disperse a Shiite rebel sit-in blocking the road to Sanaa airport as part of a protest campaign, demonstrators said. Police hurled tear gas canisters and deployed water cannon against demonstrators who had camped along the road near the interior ministry, an AFP correspondent said. The protest organising committee said one demonstrator was shot dead, adding that a number of protesters received gunshot wounds. Sunday's move came after protesters did not heed an ultimatum to clear the area, and apparently after some approached a checkpoint leading to the nearby interior ministry. The Huthi rebels, also known as Zaidis or Ansarullah, have been pushing for the government's resignation, accusing it of corruption. They have rejected overtures from President Abdrabuh Mansur Hadi who has offered to name a new prime minister and reduce a disputed fuel price hike. 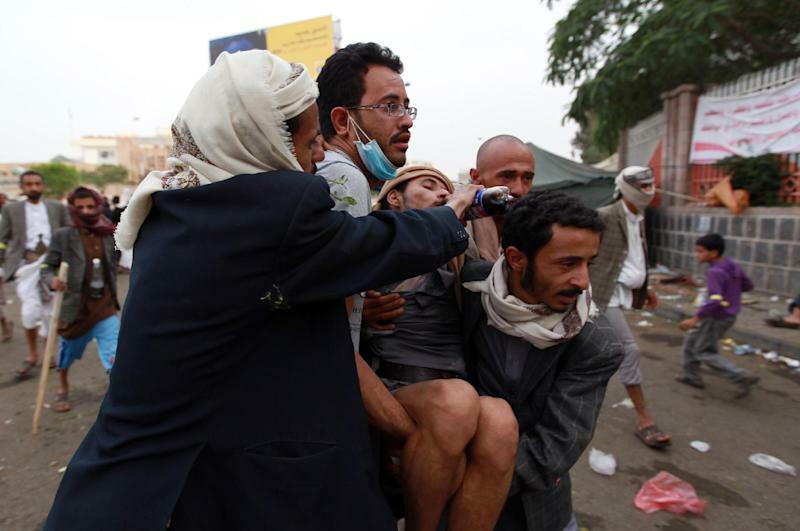 Rebel spokesman Mohammed Abdulsalam accused the authorities of "using live bullets" against the demonstrators. "We hold the authorities responsible for the repercussions of this aggression, and we stress the right of our people to self-defence using all means if the aggression continues," he said in a statement. But calm returned to the area later Sunday, despite protesters not clearing the blocked road, an AFP correspondent reported. Earlier in the day, protesters pitched new tents blocking access to the ministries of electricity and telecommunications on Airport Road, where they have been demonstrating for weeks. They also blocked access from the capital to the international airport. The protesters erected cement road blocks along the road to the airport and wore yellow bands on their wrists and across their foreheads as a "warning" to authorities. A source close to the presidency told AFP the Huthis have submitted a list of demands, including "uprooting corruption" as well as "giving them more powers within the public prosecution, accountability panel, national security services and the intelligence" services. They also demanded that the president "consult with them on naming the new prime minister" and the ministers of defence, interior, foreign affairs and finance. Sunday's demonstrators carried portraits of Syria's embattled President Bashar al-Assad as well as of the head of Lebanon's Iran-backed Shiite Hezbollah movement Hassan Nasrallah and of Yemen's Shiite rebel chief Abdulmalik al-Huthi. Authorities in Sunni-majority Yemen accuse Shiite-dominated Iran of backing the rebels, and Hadi on Saturday urged Tehran to be "reasonable" in dealing with his country. Banners at the Huthi sit-in vowed that the protests will "continue until the fall of the Muslim Brotherhood government" a reference to the Sunni Al-Islah (Reform) party. Tribesmen linked to Al-Islah have been fighting the rebels alongside government troops since last year. The rebels accuse the government of Prime Minister Mohamed Basindawa of close ties to Al-Islah. 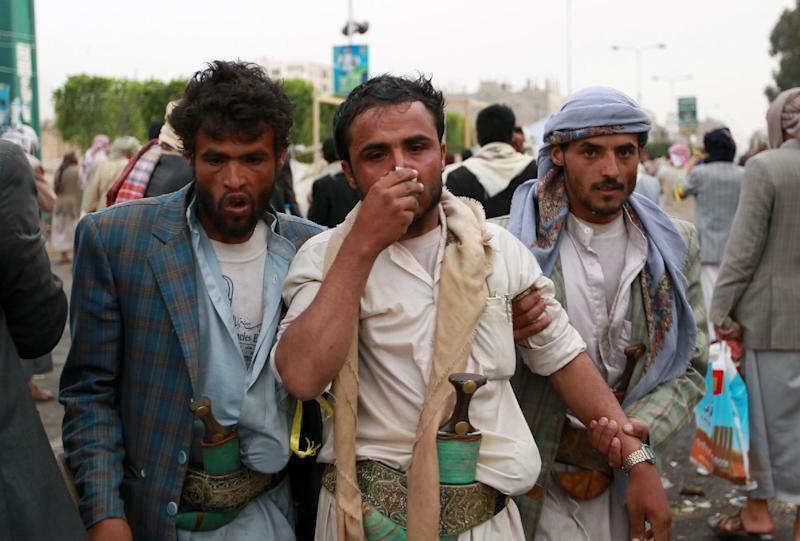 Tribal sources said on Sunday that fighting also continued between army-backed tribes, allied with Al-Islah, and Huthis in the Ghayl and Majzar regions straddling Jawf and Marib east of Sanaa. The sources said there were "casualties", but were unable to provide a toll. 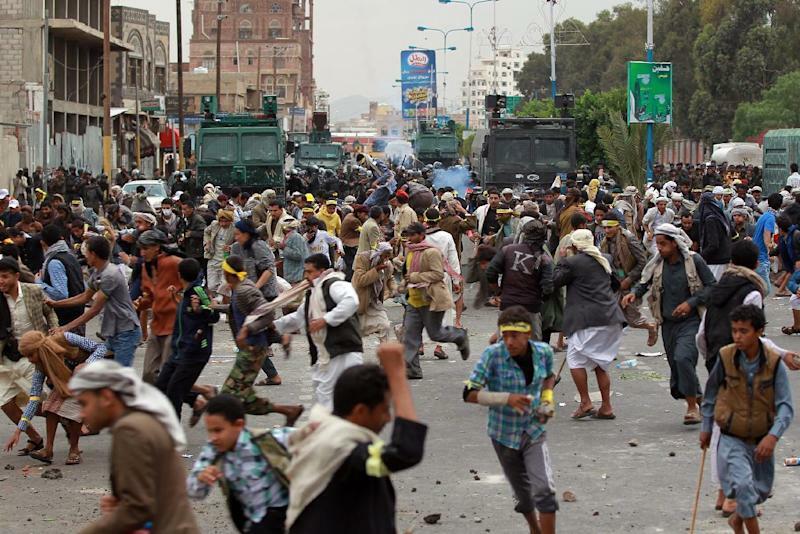 Thirty-four people were killed in similar clashes between Thursday and early Saturday. Analysts say the rebels are trying to establish themselves as the dominant political force in the northern highlands, where Shiites are the majority community.